The SQL Server 2016 Query Store can give you valuable performance insights by providing several new ways of troubleshooting queries, studying their plans, exploring their context settings, and checking their performance metrics. However, it can also directly affect the performance of queries by forcing Execution Plans for specific queries. So far, in this series of articles about the SQL Server 2016 Query Store, we have taken a look at its architecture, explored the built-in reports and shown the various new DMVs related to the Query Store. 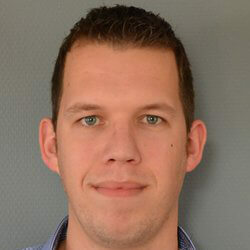 Up until now, we mainly focused on the query runtime, information-gathering and reporting. Another great feature of the Query Store, the ability to easily force Execution Plans for specific queries, has thus far just been mentioned only briefly. In this article, the fourth in the series, we will focus on the plan-forcing options inside the Query Store, and show how you can use it to battle the problem of “plan regression”. Before we dive into the details of how we can force an Execution Plan for a specific query, I want to spend a few moments explaining a phenomena known as ‘plan regression’. 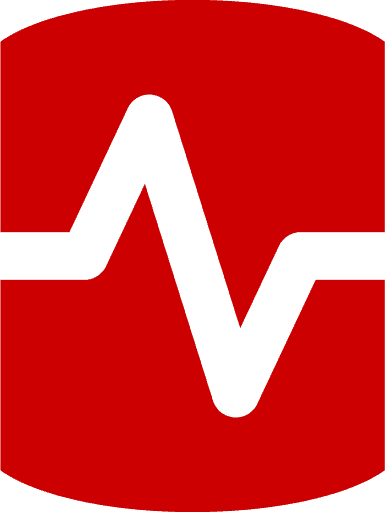 Plan regression happens when the SQL Server Query Optimizer compiles a new Execution Plan for a query that performs (much) worse than the previous Execution Plan for that same query. 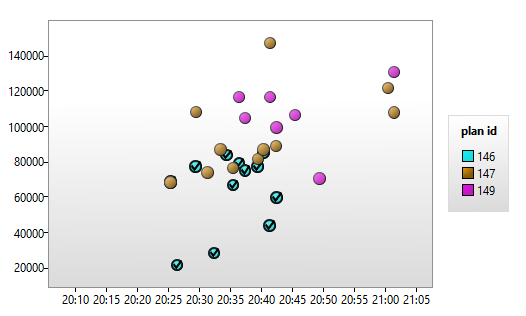 The graph above shows us that query 104 generated two plans during execution, plan id 113 and plan id 114. Looking at the graph above immediately shows the advantage of the Query Store, in one glance, we can see that the Execution Plan with id 113 performed much worse, based on its duration, than the plan with id 114. Before we had access to the query store, it was frequently a complicated and time-consuming task to analyze plan regression: We had to try and capture the different Execution Plans that were generated and compare them. Thankfully, The Query Store visualizes the information in which we are interested; we can then easily and quickly compare the different Execution Plans of the query in question by using the “Compare plans” button as shown in Figure 20 below. In the past, when we wanted to force a specific Execution Plan for a query, we had to go through some pretty complex steps to build a Plan Guide and force it on a specific query. To give you an idea just how time-consuming and complex the task of creating and forcing Plan Guides can be, take a look at the simple queries below. 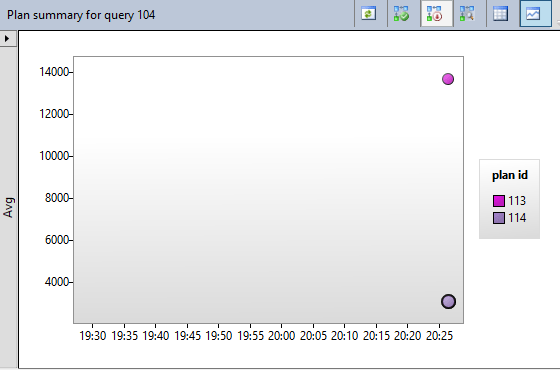 To demonstrate this easily, I ran both queries inside one SQL batch. As you can see, both queries are identical, the only difference being in the p.ProductID value inside the WHERE clause. Both of the Execution Plans are shown in Figure 21. Now imagine that we wanted to optimize this query by making sure that the first Execution Plan would always be selected. To do this, one of the options is to create a so-called Plan Guide. We would then link the Plan Guide to the query so that every time the query gets executed, SQL Server will pick the plan we supplied for the Plan Guide. To do this we would have to follow the following steps. Also keep in mind that creating Plan Guides is a very precise action. For instance, aligning the query text just a bit different can result in the Plan Guide not being used.Now that you have an idea of the actions you would have to perform in order to specify a specific Execution Plan for a query in previous versions of SQL Server, let’s take a look how we can do the same thing using the Query Store. The “Force Plan” button in the reports is, by far, the easiest option to use. 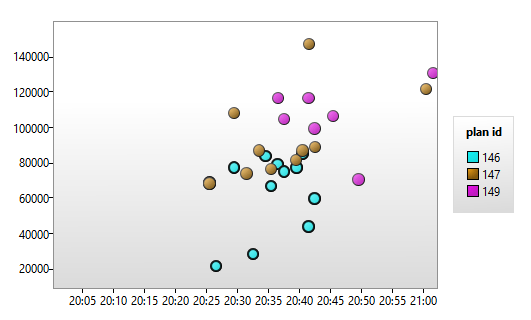 Figure 23 shows the Execution Plan graph of the queries we executed earlier in the previous section. As you can see in the figure above, my testing with Plan Guides generated three different Execution Plans. Since I am interested in using the Execution Plan with ID 146 for the queries, which is the same one as in Figure 22, I only need to click on the plan inside the Execution Plan graph and press the “Force Plan” button as shown in Figure 24. 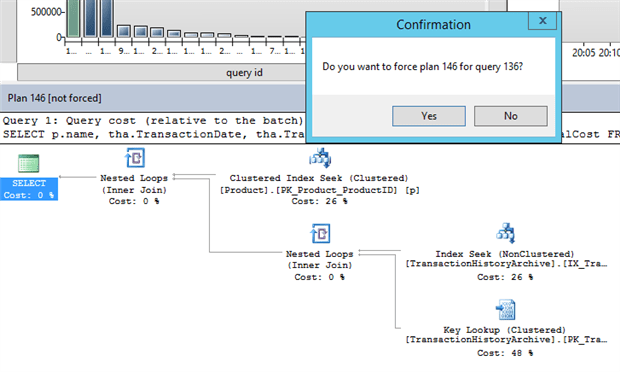 After clicking “Yes” the Execution Plan graph will change, indicating that the query is now using that specific Execution Plan. If I were to once again execute the query that we used earlier to demonstrate Plan Guides, SQL Server would use the Execution Plan selected in the Query Store to execute the query. 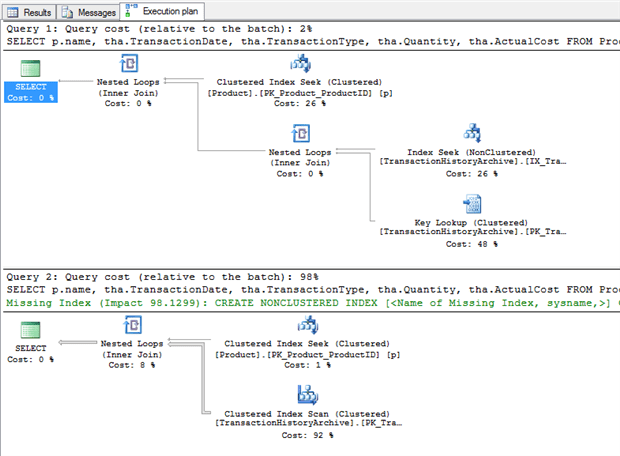 Here the first parameter stands for the query ID, the second for the Execution Plan ID inside the Query Store. As you can see, both methods inside the Query Store are a lot easier to use than the Plan Guide option, saving valuable time and immensely simplifies the process of forcing a plan. In this article we took a look at plan-regression and how it occurs. We explored the method we had to use pre-Query Store when we wanted to force a specific Execution Plan and at the end we looked at how we can force Execution Plans using the Query Store. This concludes the fourth part of the Query Store article series. In the fifth, and for now final, article in the series, The SQL Server 2016 Query Store: Query Store Performance, we will take a look at the performance impact of enabling the Query Store. Loved this but shouldn’t the call read – EXEC sp_query_store_force_plan 104, 146;? In SQL 2016 will Query Store keep Queries with Forced Plans for ever till their plan are unforced ?